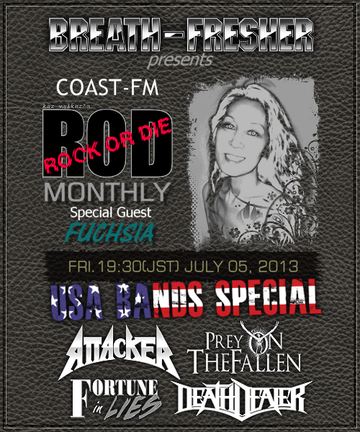 ROCK OR DIE Monthly #37 "American Bands Special" is aired at 7:30 pm (GMT+9) on Friday, July 5th 2013. Following 4 bands plus an announcement for give-away CD come up for the show. After it was aired in Japan, it can be heard on podcast on our site. ATTACKER - Album "Giants Of Canaan"
DEATH DEALER - Album "War Master"
FOURTUNE IN LIES - Album "The Other Side"
PREY ON THE FALLEN - Album "Prey On The Fallen"